Following an encounter with an alien species at the York Town space station and colony, Captain Kirk (Chris Pine) is requested by Starfleet leadership to investigate the causes of distress in order to render help. With the possibility of accepting a Vice Admiral commission from Starfleet, Kirk sees this as his potentially final mission aboard the Enterprise. Concurrently, Mr. Spock (Zachary Quinto) is also at a crossroads in his life when he receives word that Ambassador Spock has passed away, as he contemplates picking up where Ambassador Spock left off. Gathering the crew together for what may be the final mission of Kirk and Spock, the Enterprise sets out to uncharted deep space to evaluate the problems and bring about peace. Unknown to the Enterprise crew, they are about to encounter their darkest times yet and a villain named Krall (Idris Elba) who seeks an artifact in the possession of Kirk and has a mission to destroy the Federation and bring about his own version of peace–called chaos. As a long-time Star Trek fan myself (TNG & Voyager), one of the very first elements I picked up on at the beginning of this installment was the trademark bridge sound effects from the original Star Trek TV series. Employing a little suspension of disbelief, what with all the flat panels and touch screen displays and all, the bridge of the NCC-1701 Enterprise still boasts the old soul of the bridge that started a universe of adventures that continue to this day. Fortunately, visionary producer J.J. Abrams, director Justin Lin, and writers Simon Pegg & Doug Jung craft a story that mostly takes what made the franchise so endearing and channel it into an exciting story for audiences today. From the characters to the dialog, and from the interpersonal interactions to the settings, this Star Trek movie effectively leads the reboot of the franchise in the right direction. Having just watched Abrams’ Star Wars: the Force Awakens back in December, I was very curious as to how similar Beyond would look and feel as compared to the aforementioned. Forced to decline the director’s chair for Star Trek: Beyond, Abrams turned the reigns over to Lin while still serving as the creative producer. Directing Star Wars and producing Star Trek could have left audiences with similar cinematic experiences; however, both movies are vastly different but provide fans with excellent additions to the respective universes. Prior to screening the movie, I was very skeptical going into it since the various trailers for the film were disappointing–looked like the film was going to be cheesy. To my surprise, the film was definitely not hokey and played out exceptionally well. Compared to the previous two films, I definitely like this one much more. 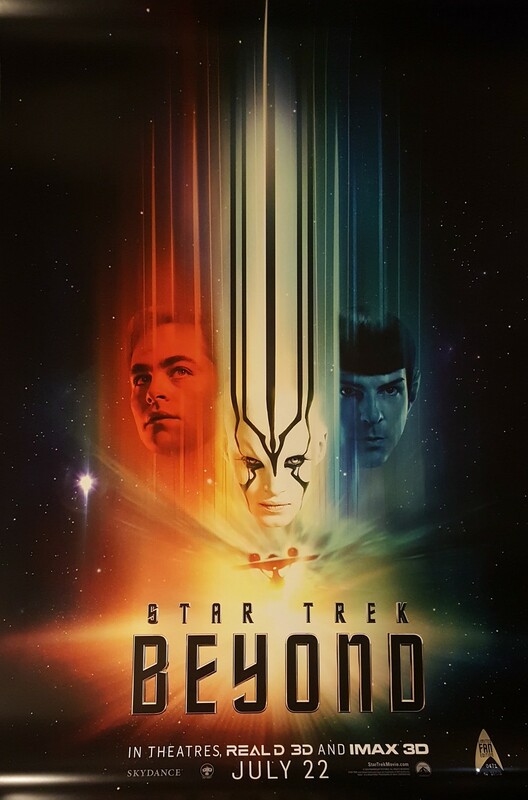 That is mostly attributed to the fact that Beyond felt like a Star Trek movie. The previous two installments felt like a Star Trek movie taking place inside a Star Wars-esque universe. Hopefully, this film will redirect the reboot of the motion pictures in a direction more closely aligned with the original series and movies. With Star Wars and Star Trek trying to find their respective places in today’s culture of media, entertainment, and gaming, it is important for both series to be distinctly different from one another. Now, I don’t mean different stories or characters–obviously, that’s a given by default–but I mean the feel of the stories needs to be unique. Star Wars is an action-adventure mostly concerned with good v evil and Star Trek is science-fiction that concerns itself, traditionally anyway, with the human condition. Both take place in the future, but are different experiences. There is demonstrable evidence in Star Trek: Beyond that the franchise is seeking to stay true to its roots in anthropology and psychology; whereas Star Wars: the Force Awakens is staying true to its roots in futuristic good v evil in a galaxy far, far away. From a technical perspective, the film is flawless; however, it would have been nice to have seen more practical effects and miniatures more so than digital effects, albeit, the effects were impressive. I appreciated the focus on the interpersonal relationships between the characters, and how it upstaged the actual conflict. Yes, the conflict in the story is important and is what drives the action, but it’s the characters themselves that are the most important element in the narrative. Does this film shift the dominant focus off Star Wars and onto Star Trek? Not particularly. But does this movie pave the way for the Star Trek movies to be on par with the Star Wars movies? I believe that we could begin to witness that trend. Star Wars has the massive advantage of being owned by the Walt Disney Company; and therefore, TWDC is integrating that IP into the parks, cruise line, and merchandise. That is HUGE. Unfortunately, Star Trek does not benefit from being owned by a distribution company and legacy studio with theme park investments in the United States, anyway. Paramount did have amusement park investments, but sold them off to Cedar Fair many years ago. Perhaps the interest in the Star Trek movies and upcoming TV series in 2017 will generate a desire for this IP to become part of a themed entertainment property as well. With so many choices this weekend for movies it is hard to decide what to see! I am looking forward to watching Lights Out now that I have watched Star Trek: Beyond. Whether you are a fan of the original series or movies OR you are a new fan to the Star Trek universe, I feel confident that you will find much to enjoy in this newest installment in the Abrams reboot. Hopefully the film will perform well over the weekend and begin to generate an interest in the upcoming TV series as well.